Promise this is the last previous dressage blog I will run- please feel free to comment on any of the posts! that’s my favorite part- generally the comments are better than my posts! In 1995 I traveled to Atlanta to audit a Charles DeKunffy clinic hosted in Alpharetta, Georgia. As I wound my way around the charming towns of Roswell, Milton and Alpharetta I knew that I had found the place I wanted to live. Within a year my horse Sy and I moved from South Carolina and found ourselves living in the place I consider “home”. Home has always been an elusive concept for me as I was raised in the Air Force and lived in three different countries and four different states before I graduated high school. I loved every one of these places and the horses, barns and friends that I met along the way. 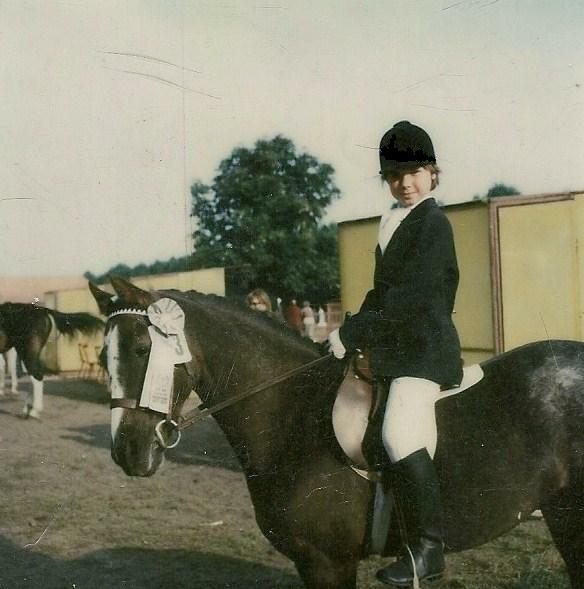 From riding gymkhana and jumping ponies with Andrea in England to beginning dressage and show jumping with the German kids at the stately riding center in Zweibrucken, Germany, Europe began my love for all things horsey. Lucky enough to land at Sand and Spur Riding Club on Eglin Air Force Base in Fort Walton Beach, Florida I met an amazing family of people that shaped my life. The friends I met there are second to none. I consider the times at workday, riding in the bay, and club horse shows some of the best times I will ever have. Unfortunately due to the nature of the military the people that aligned in that magical period of time have since scattered across the globe. South Carolina and Longcreek Equestrian Center introduced me to Scott Peterson who unknowingly converted me to a dressage only rider. It is here that I found my path to my career in horses. I met Sabrena (of Better So Dressage Blog) a friend that encourages me when I’m down and shares my passion for dressage. I wouldn’t trade any of these places or experiences for anything in the world. They are what made me the trainer I am today. But it is in Georgia that I will always feel most at home. For fear of excluding any one of the hundreds of friends, trainers and students I have known in Atlanta I won’t name any names but Atlanta is the place I will return to when my duties in South Carolina are complete. In addition to the huge community of riders, Atlanta has hundreds of amazing barns to meet the needs of all. Most of all it is the supportive nature of the people I have met there that keeps drawing me back. Atlanta has seen the best of me and the worst of me, I have made lifelong friends and I have made some big mistakes but somehow that all becomes part of the fold and the focus on horses keeps bringing us back together. I wish I had the words to better express how I feel but I guess I can’t top the great Ray Charles…. Understandably there has been a lot of controversy lately over the possibility of mandatory helmet rules for dressage competition. Although personal safety should be an individual’s choice it is difficult to defend the decision of not protecting one’s own head. The main concern for not mandating helmets seems to lie in the fact that helmets are not as visually appealing when worn with the customary dressage attire, particularly the shadbelly jacket. A top hat, which offers little to no protection at all, is far more appealing when wearing such an outfit. Recently, as a possible alternative to helmets, companies have been designing “hard-hat” type top hats as they have for cowboy hats for western rider’s safety. These hats, while safer to ride in, are bulky and clumsy, thus negating the point of having a visually appealing hat. Although this suggestion may upset some classicists I believe it may be time to consider embracing the helmet and updating the attire. Yes, that means quit competing in tuxedos. 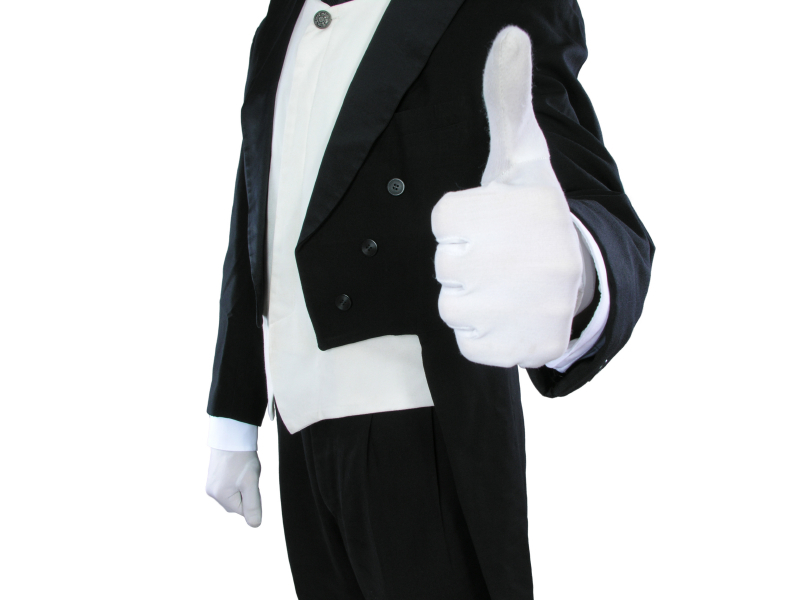 Tuxedos are certainly classy outfits for weddings or the opera but not necessarily clothes that inspire athleticism. Many other athletic events require helmets and maintain a dignified but athletic turnout. In addition to being visually compatible with safety gear, more athletic attire can be manufactured with fabrics that are more conducive to sports functionality. Wearing a blazer and an Ascot with leather boots while participating in an athletic event in the deep South in September seems somehow non-sporty. While I have a deep respect for tradition and believe that the principles of riding and training should be passed from generation to generation, the time may have come to consider updating the attire of the modern equestrian. Athletes in every sport benefit from advances in fabrics and modern technological design for comfort and performance, why not us? If we want the rest of the world to respect our sport as an Olympic discipline we may have to suit up looking like the athletes that we are. Four ibuprofen down the hatch as my right foot throbs! Another job related injury! The names of the parties involved have been changed to protect the victims, wait a minute, I am the victim! I teach a lovely lady we’ll call “Bonnie” that owns a small riding facility at her home several miles from the barn in which I board my horses. With a show a couple of weeks away it’s time to trailer the horses over to ride some tests while also getting them used to traveling off of the property. Horses arrive, check out the place, walk into washracks, everything is fine. Here’s where things take a turn. The horse Bonnie is going to ride tacks up without incident. My process does not go quite as smoothly. My ride, we’ll call “Bernie” has a girthing issue, that I should have remembered, as I have tacked him up at his own house many times. This is where I erred, as Bernie is one of several horses I have known over the years that if girthed too quickly will buckle at the knees. This is exactly what happened. I didn’t ratchet it up, however, there are certain horses that must be girthed very slowly to prevent such a reaction and care must be given every time. I confidently put on the saddle, buckled the girth and walked out of the washrack to grab the bridle. When I turned around with bridle in hand Bernie’s legs buckled and he collapsed on to the mats of the washrack. The fall frightened him, causing him to flip and thrash around in the crossties. Luckily the crossties have quick release connections and one of them gave way. After a couple of seconds that felt like hours, Bernie settled down and laid (lay, laid) down in the washrack, confused. He was still enough that I approached his head and unclipped the crossties on each side of his halter and backed up so he could get back up on his feet. I got two steps back when he launched himself up off the ground with his hoof pointed like a ballerina’s toe slamming straight down on top of my foot! Wham!!! My entire body got hot with adrenaline, followed by a cold, clammy sweat! Yes, Yes, Bernie was fine! However, my foot felt shattered. I was lucky to be wearing my riding boots at the time. I know this incident is not uncommon. We have all had hundreds of foot smashing, toe stepping incidents but it brings up a conversation I have every summer with students concerning barn footwear. 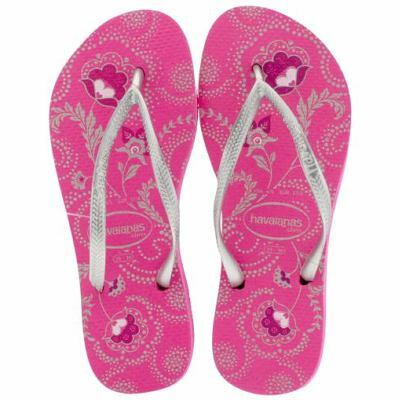 Invariably , every summer I will have a conversation with at least two or three different students who will show up at the barn for the day with flip-flops or sandals on. I always say “you probably need to wear something more substantial, you might get your toes cut off”. The reply that follows usually sounds something like “I’m not going to get my horse out of the stall, I’m not even going to lead a horse”. This sounds fine, in theory. However, you never know what might happen that you may have to become involved in. If a horse gets loose and you have to help catch him, you are suddenly leading a horse. If a horse gets tangled in a wire and needs immediate help, or falls in a crosstie, or a hundred other emergency scenarios and you are needed to jump in and help out, it is not practical to be wearing footwear that will compromise your feet. Even here in the hot and humid South, and even as cute as your sandals are, and even if you are wearing shorts, sturdy boots or shoes are your best choice if you are at the barn for any period of time. Dont fret, your Facebook pictures will look cuter with you with boots on than with you on crutches anyday! I usually try to avoid news related topics, as news is more accurately reported on news sites, this forum is generally based on my opinion but it seems pertinent to address the recent tragic accident of America’s Olympian Courtney King-Dye. If anyone is still unaware of the accident she was riding a young horse in warm-up at a competition when the horse slipped and fell, fracturing Courtney’s skull. Courtney is still in a coma at the time of this writing. Horse Channel.com has an article with more details on the accident and an address to Courtney’s Facebook page as well as a mailing address for well wishers. I will include them at the bottom of this post as well. This accident has stirred a lot of debate in the dressage community concerning mandatory use of helmets at competitions. I received a letter from my local GMO yesterday requesting feedback from members of the equestrian community, as horse show organizers are fearful that if they alone enforce such mandatory regulations they may suffer loss of entries to shows that do not enforce the safety measures. While I understand that entry money is what makes horse shows possible, hiring judges possible, etc. I am saddened that cash flow is the determining factor in most every decision that arises anymore. 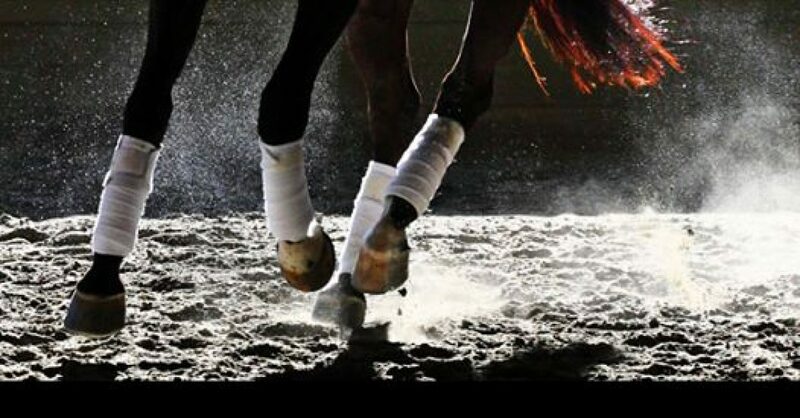 It seems that competition dressage should now be termed commercial dressage. As those who know me can testify I rarely, if ever, wear a helmet. I am certainly not bragging about this, just stating the facts before someone else does in my comment section!! In fact, I was forced to purchase one to ride while schooling some riders on a cross-country course a few years ago and in mock protest picked one with a picture of Mickey Mouse riding a horse on it. After that day, I wore it very rarely. It is not that I consciously disagree with the use of helmets, I wore them when riding as a child and when I used to jump. I believe I am of the age that safety was not as stringently observed and regulated as it is now. Seatbelts were not mandatory and I’m not sure many people used them when I was young. Nobody wore helmets when riding a bike, or skating as they do now. 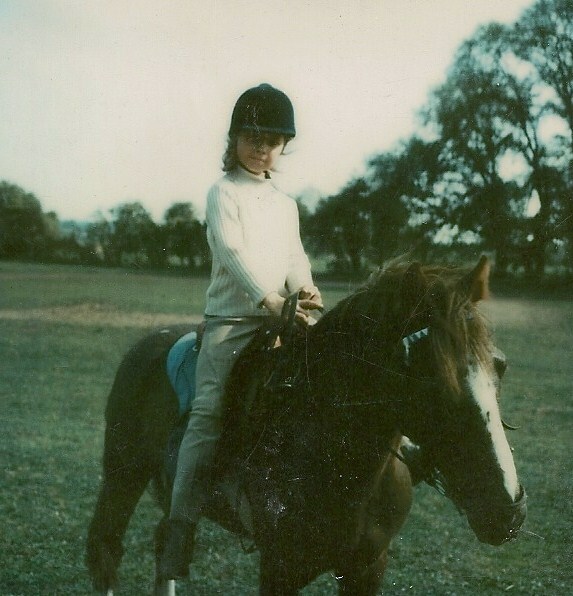 I was, however, bucked off a horse a few months ago that was startled by my swishy jacket (see my first blog post!). The next time I rode the horse, I removed my jacket! and asked the owner if I could use her helmet. She had a Charles Owen helmet and it fit me perfectly. The horse behaved wonderfully and luckily I didn’t have to test the helmet but I must admit I did feel safer and rode less apprehensively wearing the helmet. After the ride I examined the construction and realized they have come a long way from the Mickey Mouse helmet that was little more than thin plastic over egg cartons. Ever since riding with that helmet I tossed around the idea of purchasing one of my own. Oddly enough I bought one the day before Courtney’s accident. It is still not a natural instinct for me to grab it and wear it every time I ride, but I did yesterday and I do see the value in it. I don’t yet know where I stand on mandatory helmet rules. This opens up more questions like wearing protective vests or break-away stirrups. I am coming around myself, however, to wearing the helmet, both for my own safety and as an example for the kids I teach. As for the adults, that is a decision they can make for themselves. I sympathize greatly with Courtney and her family and wish her the speediest recovery. Please send her your well-wishes on Facebook or by mail. Every acknowledgement and intention of well-being goes a long way in helping the recovery process. 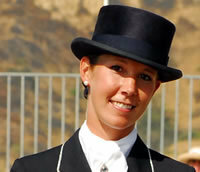 She is a great rider and an inspiration to all dressage enthusiasts. It is an unfortunate reality that no matter how many safety regulations are enforced, there is always a risk of injury when riding a horse, no matter how accomplished the rider or how quiet the horse. Check out Behind the Bit’s post today for some interesting information on head injuries. We’re all rooting for your recovery Courtney, get back in the saddle soon. Me and Sammy in Germany ’79. Ponies make great teachers! Saturday promises to be exciting as I am spending the day with some of my best friends, Ponies! The Atlanta Pony Club is meeting me at Foxberry Farms in Dallas, Georgia for a full day of dressage lessons. British Pony Club and have a great deal of respect for the organization. Any rider that has earned the rating of “A” ponyclubber is not only qualified to be a professional rider but has proven to be an expert in horse and barn management as well. To check how you measure up click here for the United State’s Pony Club’s Standards of Proficiency for H-B, HH-A Levels (the horse management section of the “A” level). The Dressage Specialty Riding Test is no walk in the park either! As riders “rate” through the system, starting with the fundamentals of horsecare and riding, they prove their skills through testings. These are no easy tests! Safety and the integrity of the ratings are a priority and much preparation, instruction and hard work goes into preparing the riders for their ratings. 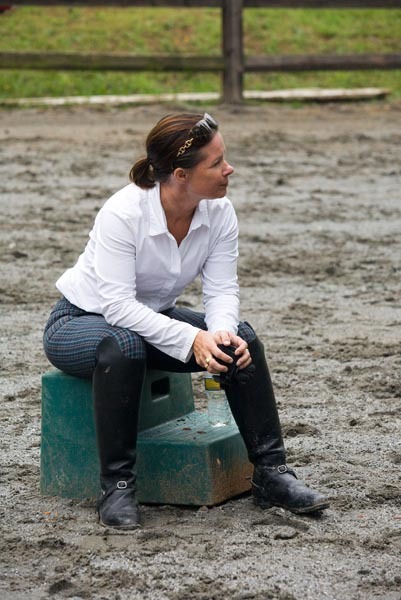 Rallies are held for concentrated coaching before rating sessions and the ponyclubbers must work together with a team in all areas of barn management. To make sure the kids are focused and learning the information themselves, parents are not allowed in the barn area at rallies. Don’t get the idea that Ponyclub is all work and testing! Ponyclubbers learn while having fun! Jumping, gymkhana, eventing, foxhunting, all types of English riding opportunities abound, both at the local and national level. Scholarships are even available for hard-working applicants. If you are a young rider or if you have a young rider in the family I strongly recommend Ponyclub for a well-rounded horseman’s education. It’s a well-known fact, no one can teach you more than a pony! A successful competitor prepares ahead for the next exercise! Despite the less-than-cooperative weather we’ve encountered this winter the competition season is upon us. Time to start navigating through the tests and working out the geometry of the arena. Just the mention of test riding has a paralyzing effect on many riders. It may be more productive and less fear inducing to think of it as a demonstration of your training rather than a “test”. A ride in front of a judge, (as well as at home for that matter) should always demonstrate the rider’s understanding that maintaining and/or improving the horse’s natural gaits are the top priority. A quality transition ridden a stride late is more acceptable than an abrupt, unbalanced transition ridden precisely at the marker. While riding the diagrams accurately is always important, the test is designed to demonstrate that the rider has an understanding of the correct fundamentals of the level being shown. 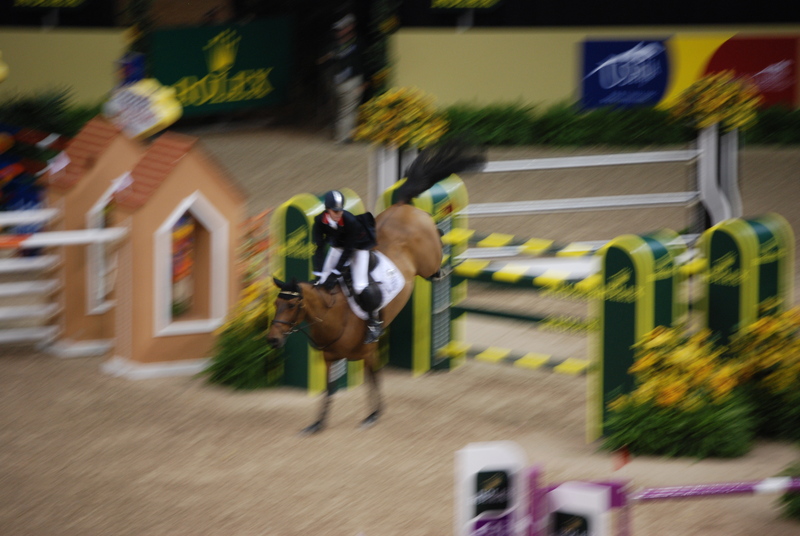 Of course, an accurately ridden figure is ideal, but never sacrifice the balance! Preparation for each movement is the responsibility of the rider. This is what the corners of the arena are made for! There are two opportunities (corners) before each movement to make sure that the horse is forward, engaged and on the rider’s aids. The set-up for the next exercise should be done in the corner before it is performed. If the rider fails to utilize the corners to adequately prepare the horse, resulting in a movement that is marred by a loss of rhythm or balance, the price will be paid in the rider’s collective marks. Several times before the show, have someone videotape your test ride. It is not uncommon to feel that the horse is clipping along in a forward fashion, only to see the ride on a video later and realize it was actually painfully sluggish. The opposite is also true, I have ridden many tests that I thought were nice and steady only to see them on video and realize I was rushing the horse off his feet. Ride the rhythm of the gait and work the exercises around it. In the end, nobody, including the judge, is expecting perfection from your horse. The show is designed to demonstrate that your training is progressing correctly to continue through the levels. Ride your horse proudly and be forgiving if he is less than perfect. Even if there are errors in your ride, a tactful rider that is grateful for the ride is a winner in any good horseman’s eyes every time.